In recognition of National Doctors’ Day on March 30th, Collier County Medical Society (CCMS) is pleased to announce that James Talano, M.D. is the recipient of the 4th Annual CCMS Physician of the Year Award. The award honors a CCMS member who deserves special recognition for exemplary contributions to the practice of medicine and/or outstanding service to our community. Members of the Medical Society submitted nominations for this prestigious award to the CCMS Board of Directors, who have selected Dr. Talano from the talented pool of candidates. The award will be presented at the CCMS 61st Annual Meeting & Installation of Officers, May 19, 2018 at Wyndemere Country Club. Seats and sponsorships can be purchased online or by contacting CCMS: (239) 435-7727 or info@ccmsonline.org. Dr. Talano was nominated by his colleagues Dr. Paul Jones and Dr. Sajan Rao. 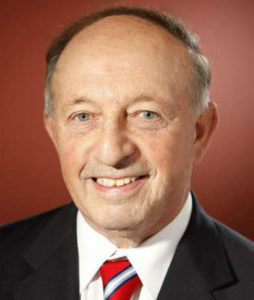 The nominations described Dr. Talano’s contributions to the community as founder and clinical director of The SWICFT Institute of Southwest Florida; numerous publications in cardiovascular disease; appointments as professor, director, and chief of top cardiology programs; leadership positions with CCMS, the Southwest Florida Physicians Association, Collier County Emergency Medical Services Board, and NCH Healthcare System; and his volunteer work at the Neighborhood Health Clinic. Dr. Talano is also a retired Major in the US Army Reserve Medical Corp.